Private label cosmetics are makeup and skincare products made by a manufacturer but sold under your own brand. This allows salon owners, estheticians, online sellers, and others to build a beauty label without investing in formulating, testing, and production. As your private label business grows, you’ll spend an increasing amount of time packing and shipping online orders. Try outsourcing your fulfillment process so you can spend your time actually running your salon or online store. Use FulfillmentCompanies.net, a free fulfillment matchmaker, to match you with one of their national and/or regional fulfillment companies to handle your online orders for you. Click for a free quote. If you’re ready to start building your own beauty brand, we’ll show you how to do so in 5 easy steps. There are two primary ways you can search for private label cosmetics suppliers: online or in-person at beauty industry trade shows. We’ll explore each of these options below, but first, let’s discuss your goals for your branded beauty line. The first step in your research is to define exactly what you want in your beauty line to help pinpoint what you need from potential suppliers. Call this your must-have list. For example, do you want only organics products? Do you want a line of skincare products, makeup, or both? Do you want products that contain certain ingredients? List everything that matters to you. Do they print labels and packaging for you? What are the label and packaging fees? What is the turn-around time for new orders and reorders? Now let’s see where you can find potential suppliers. Visit a few supplier websites and you’ll see that most cover the full spectrum of private label cosmetics, from customizable makeup programs to full skincare lines. Most suppliers offer a huge assortment, too, so you can mix and match products to craft a unique beauty products line. Supplier websites also give you great insight into how their ordering process works. 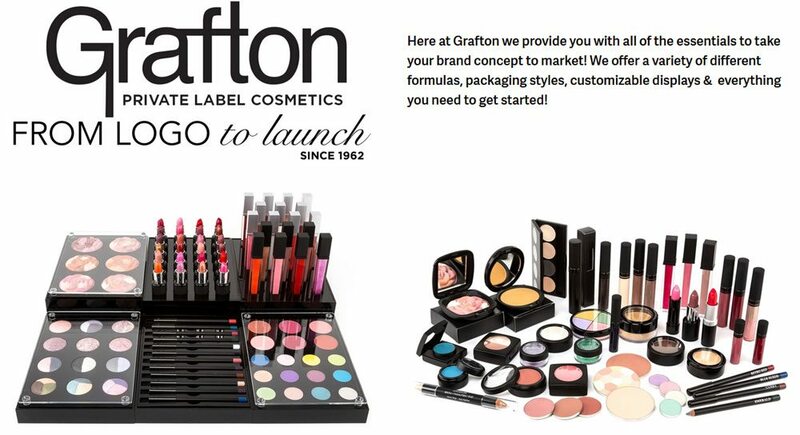 Many suppliers like Grafton Cosmetics, pictured above, even list very low minimum order requirements. So depending on the range of products you want to start with, it’s quite possible to launch your own beauty brand for just a few hundred dollars using private label cosmetics. 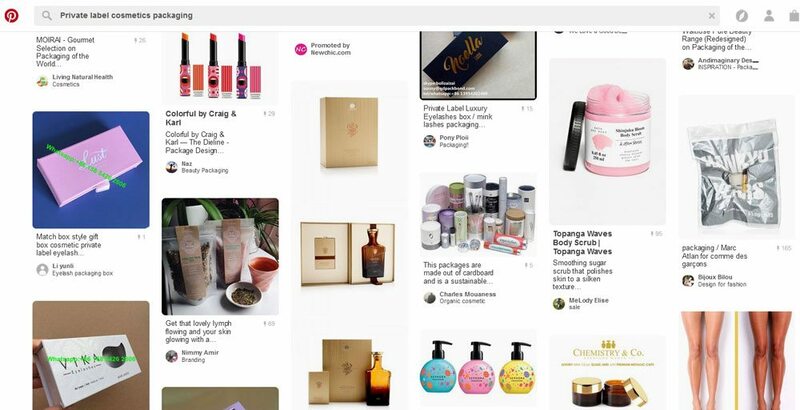 You can further refine your Google search for specific requirements on your must-have list by including terms like natural, organic, and cruelty-free in the search box. Include whatever terms you require to define your own unique beauty brand. Note! In your online research, you’ll find suppliers based overseas, especially in China. While these offer lower pricing, imported cosmetics may not meet US purity requirements and other legal standards. Going this route could expose you to inconsistent products, customer complaints, or even lawsuits. With so many great US and Canadian-based private label cosmetics suppliers, there’s really no reason to take this chance. Beauty industry trade shows are an excellent way to meet many private label suppliers in one convenient location. At these shows, you can get hands-on experience with many products and even leave with plenty of free and low-cost samples to review. Best of all, trade shows let you discuss your goals with potential suppliers in person and develop a relationship. Attending trade shows is probably the fastest way to research suppliers and build your beauty brand. To find a show near you, visit a major supplier website. Most will have a trade show calendar page, like the Audrey Morris trade show page below. If you decide to attend a trade show, be sure to look up the show organizers on Google and contact them to make sure you have the correct credentials for entry. Some require just your state sales tax number, others need proof of an existing online or physical business. It’s best to find out ahead of time to make sure you’ll be admitted. After you’ve done your research and found some potential suppliers, it’s time for the fun part: sampling and reviewing products. If you search for private label cosmetics suppliers online, you’ll see that most offer low-cost sample kits or allow you to order single samples. Going this route, you’ll spend some money on samples, but this gives you a chance to check out products in person. If you can attend an industry trade show, you can pick up loads of free or low-cost samples all at once. However you acquire samples, once you have them, your next step is to thoroughly review each product to see if it meets your expectations and fits your beauty brand. Here, your opinion matters most, but it’s also a good idea to get input from others. If you have a shop, spa, or set of clients, you can get them involved in trying out different products to see what everyone likes. After all, they are your potential buyers. If you don’t have an existing clientele to tap, gather some friends to try out products and provide feedback. It might take a few rounds of reviews and maybe even a few rounds of sample items from different suppliers, but eventually, you’ll find a collection that defines your brand. When you have a solid idea of the line you want to sell, it’s time to think about how you’ll sell it. In-store: salon, spa, specialty fashion boutique, natural foods shop, etc. 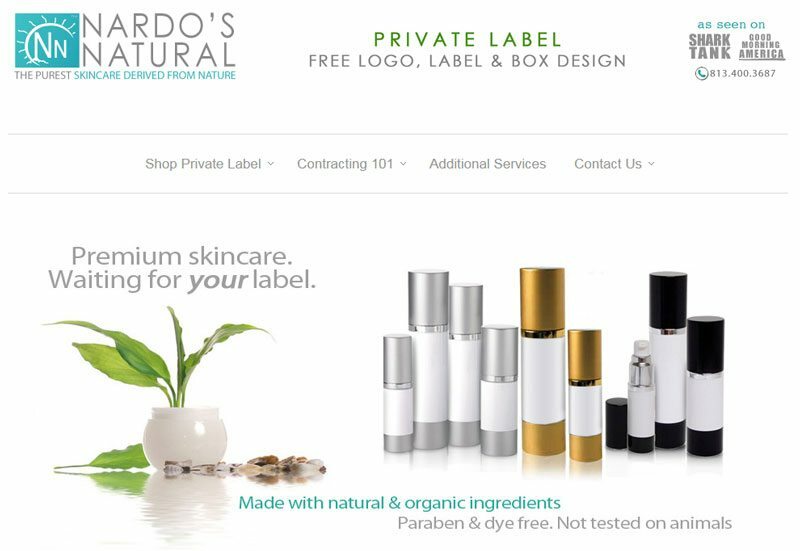 If you plan to sell primarily on Amazon, some private label cosmetics suppliers like Nardo’s Naturals, below, make the process quite easy. If you use Fulfillment by Amazon (FBA) to store products and ship orders, they send your items to Amazon for you, too. This is something to consider if Amazon sales are your main focus. You have many online selling options beyond Amazon, too. These include ecommerce websites, blogs with online store sections, and social media sites like Facebook and Pinterest. Even if you think you’ll sell primarily on Amazon or through social media posts, you need to seriously consider launching your own website. Your own site is the best place to build a brand identity that’s uniquely yours and under your complete control. You can even launch one for free using Square. Learn how to manage in-house fulfillment from your home, shop, or warehouse. Learn how to outsource fulfillment tasks to a fulfillment center. Planning to sell private label cosmetics from your own ecommerce website or beauty blog? Then you’ll also need to decide where you’ll store products and how you’ll pack and ship orders. Try outsourcing your fulfillment process with the help of FulfillmentCompanies.net, a fulfillment matchmaking company. It matches you with the partner that best suits your business’ needs — for free. Click here to get started. As you explore potential suppliers, you’ll find that most take care of the labeling and packaging process for you. You just supply your logo and they do the rest. This is the simplest way to label and package your private label cosmetics. It produces a professional look and ensures that your labels are correct per ingredients lists and other packaging requirements. Many private label cosmetics suppliers also provide free images of your branded products, like the one below from Nardo’s Naturals. If you’re selling your beauty collection online, you can use these images to build your website or Amazon listings. This saves you the time and expense of photographing products yourself or hiring a pro. Most private label cosmetics suppliers charge label printing and packaging fees on top of your product cost, so be aware of this during your research. These fees are clearly listed on most supplier websites. If you have any questions, a call to their customer service line should clarify any packaging fees or process questions you have. To get your products labeled with your logo, most suppliers have you upload your logo with your order. Suppliers provide logo specs including the number of colors allowed, size restrictions, and file types. If you don’t have the design skills to create your own logo, don’t worry. You can find budget-friendly freelance artists to design a great logo to your supplier’s specs on Fiverr. Or, some suppliers offer logo design as a service, too. If you want to try your hand at designing a logo, this logo design software can make it easy. In most cases, after your private label cosmetics order is placed, you’ll have a few weeks until it arrives. Use this time to get your website and other selling outlets like Amazon and social media pages up and running, or your store or spa set up for your new beauty line display. Private label cosmetics are a simple and low-cost way to build your own beauty brand. Many cosmetics and skincare suppliers cater to private label customers ranging from spas and salons to online sellers and personal beauty consultants. Entry costs are so low and variety is so great that even fashion boutiques, healthy living brands, and active lifestyle businesses are expanding into this high-demand market. Once you’ve selected your supplier and products for your initial line, you just need to design your logo, place your order, and plan out your selling strategy. And remember, don’t tie yourself to just one selling outlet. Your plan for online selling might be complemented by in-home parties, and even selling at local markets and fairs. If you have a spa or salon, your in-store sales could expand greatly by offering your products online. No matter where you plan to sell, make sure you can easily manage your business and accept payments. Use Square as your payment processing solution and you’ll be able to accept payments through your website, cell phone, tablet, or even via invoice. When you sign up, you’ll also get access to Square’s point-of-sale software, which equips you with tools that help you streamline your business management — all for free. Click here to start. Do you sell private label cosmetics and skin care products under your own beauty brand? We’d love to hear from you. Please share your experiences in the comments below. Truly mind blowing article.. All of the points are super important for best skin care!!! Right diet is real important..along with regular moisturizing and exfoliating. Good work. I have been in private label organic skin care contract manufacturing for 19 years . To buy the best eye wrinkle cream you should visit Ayuni Oragnic online shop. Thank you for your input and glad to hear that the private label model has worked for you for so long. Thank you for sharing. I’m sure you’ll inspire others to follow their dreams. I have been wanting to invest in my own cosmetic company for a while now but didn’t want to spend more than $150,000. So, because my budget is very small for this industry, I had no clue where to start and felt hopeless. Thank you so much for sharing this, it made me see the light at the end of the tunnel and to go for it ! I’m so happy that this helped you figure out a path to get started. There are plenty of private label options out there and with a little creativity, it’s very easy to make a name for yourself with private label products. Good luck! Very informative blog! I have been in private label skin care and cosmetics contract manufacturing for 19 years and one thing that many new start ups forget is product liability insurance for their new brands, this is a MUST do. Also lately in the last 3-5 years there are tons of companies who advertise on google that are not actually private label manufacturers but re-sellers who sell 1, 2 units per product and may drop ship it, in which it makes no sense as they are shipping/ fulfillment companies not an actual manufacturer and that is risky, so make sure to select companies that have been at least 15 years in business. i would like to start my own catalog cosmetic brand or company and i would like to know how much does it cost a private label cosmetic, how much it cost one single product to sale it at the right price. Those are the things that you’ll discover as you do the research we cover in the article. Your costs, retail pricing, and profits depend on too many factors for me to analyze for you — from the suppliers and products you choose to the quantities you purchase each time. Just start searching out potential suppliers and products that appeal to you to get an idea of your initial costs. Hope this helps, good luck! You’re welcome! Glad the information is helpful.